Phew, that takes care of the brush modes available to the paint tools, the smudge tool, and the two focus tools. I already explained the Desaturate and Saturate modes available to the sponge tool (in the "Mopping up with the sponge tool" section of this chapter). That leaves the three brush modes available to the dodge and burn tools. 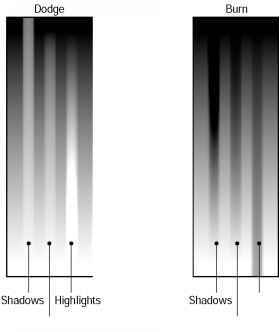 ♦ Shadows (S): Along with the Midtones and Highlights modes (described next), Shadows is unique to the dodge and burn tools. When you select this mode, the dodge and burn tools affect dark pixels in an image more dramatically than they affect light pixels and shades in between. 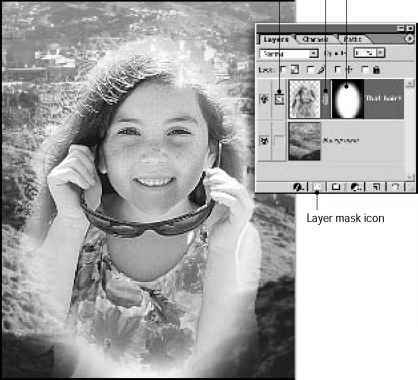 ♦ Midtones (M): Select this mode to apply the dodge or burn tools equally to all but the very lightest or darkest pixels in an image. ♦ Highlights (H): When you select this option, the dodge and burn tools affect light pixels in an image more dramatically than they affect dark pixels and shades in between. Selecting Shadows when using the dodge tool or selecting Highlights when using the burn tool has an equalizing effect on an image. Figure 5-36 shows how using either of these functions and setting the Exposure slider bar to 100 percent lightens or darkens pixels in an image to nearly identical brightness values. Figure 5-36: The dodge and burn tool applied at 100-percent Exposure settings subject to each of the three applicable brush modes.